14. 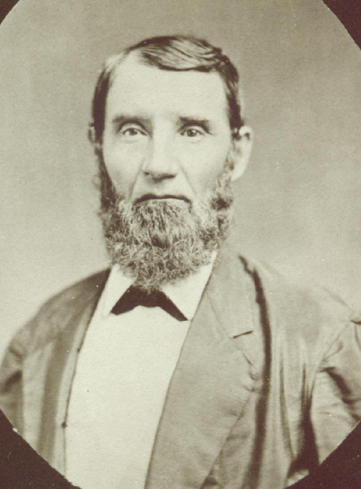 Jesse Lewis3 Cox (Joseph2, John1) was born 5 December 1815, in Wayne County, Indiana. He died 14 April 1895 at Port Byron, Rock Island County, Illinois of "La Grippe" having been sick a month, and was buried in the Zuma cemetery (called Mead's in S22). Jesse married, first, on 2 April 1840 in Rock Island County, Sarah Jennings. Sarah was born 18 December 1822 in Ohio, a daughter of David and Elizabeth Jennings, and died 9 April 1875 in Zuma township, Rock Island County. Sarah came to Rock Island County with her parents in 1839 (S120 (21 April 1875)). Jesse married second, on 17 October 1880 in Rock Island County, Mrs. Mary Jane (Looker) Jack, who was born about 1835 (or 1837 [1880 cen]) in Pennsylvania and died of paralysis of the bowels at 5:30 a.m. on 2 November 1905 in Watertown, Illinois at the home of her daughter, Mrs. Harry Nicholson. Jesse L. Cox was listed as a farmer in District 37 in Rock Island County in the 1850 (p. 194B) and 1860 censuses (p. 430). In 1860, he was a farmer in Zuma township (P.O. Hampton) and had real estate worth $6000 and personal property of $950. In 1850, his children Mary and Alban, ages 9 and 7, attended school, while his daughter Alice, age 6, did not. In 1860, his children Alban through William, ages 9 to 17, attended school, but Joseph, age 5, did not. Cox, Jesse L. Farmer and stock raiser; sec. 9; P.O. Port Byron [Zuma township]; born Ind. in 1815; came to this Co. in 1836, Rep; U[nited] B[rethren]; owns 230 acres land, value $12,000; was Justice of Peace ten years and Assessor two years; married Sarah Jennings of Ohio, in 1844; she died in 1875; six children Alban J., James L., William E., Joseph D., Mary E. and Alice A. At the time of the 1880 census, Sarah had been dead for five years. Jesse was 64, a farmer in Zuma township, living and farming with his sons Albin and William. Their housekeeper was Mary J. Jack, age 43, who lived with them, along with her daughter Laura A. Jack, age 4 (cen, p. 609B). As Mary Jane Looker, Mary had married Leslie Jack in Rock Island County on 23 December 1874 (S7). Jesse and Mary Jane were married in October of 1880, and she survived him when he died in 1895. Laura married Harry Nicholson in Rock Island County on 6 November 1894 (S7). She was of Watertown, Illinois in 1906, when she and Duane Nicholson, probably her son, attended the Cox reunion (S84). until he attained the age of majority. He then left home and went back to Indiana and worked in the Recorder's office one year, his education having been acquired at the common schools prior to his leaving home. After leaving the Recorder's office he came to Mercer Co., Ill., where he remained for some nine years, four years of which time he was engaged in breaking prairie, and then purchased 160 acres of land, on which he resided for five years. In 1849 he traded his land (160 acres) for a part of the farm on which he at present resides [in Zuma township]. Politically, Mr. Cox is a believer in the principles advocated by the Republican party. At the present writing he holds the office of Assessor and has held the office of Justice of the Peace for 12 years and also other minor offices. Religiously, he and his wife are members of the United Brethren Church. (See also S117 (19 Apr 1895)). At his death, Jesse owned a house and lot in Port Byron and a farm of 230 acres in Zuma township. His probate petition names Mary J. Cox as his widow and James L. Cox, William E. Cox, Alice Cox and Elizabeth Walker as his children and heirs. Sally (Walker) Goreth's diary (S71) states, under the heading "Mary J. Looker Cox": "Grandma Cox died Nov 2 - 1905 at 5-30 in morning mama was with her when she died. Buried at Zuma cemtry Nov 4 funeral preached at Rose Hill Baptist minister Rev. Wolverton." The same page also refers to the death of "Grandma Cox" in 1875.